year ending in the numeral 1 and things would be different. 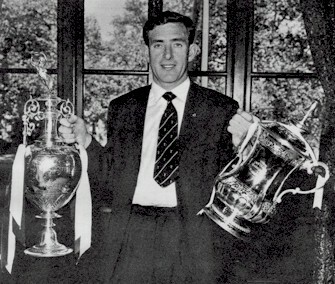 The “Year ending in 1″ superstition came from FA Cup wins in 1901, 1921, 1981 and 1991; the League win in 1951; and the magic year of 1961 when Spurs were the first club in the 20th century to win the League and Cup double. A Yorkshire club (other than Huddersfield Town) are the beaten finalists. New York were horses bearing the numbers 9, 1 and 1. Ironically, racing odds on this event were only a cumulative 9-1 – considerably lower than emotions would have suggested. Zatopkova. On July 24, 1952, Zatopek won a gold medal in the 5,000 meters, and Dana did the same in the javelin. They married and thus the triple coincidence was fulfilled as they married on the same day! During the course of a month in 1965 Jack Nicklaus won the Masters, Willie Shoemaker rode the winner of the Kentucky Derby, the Celtics won the NBA title and the Canadiens lifted the Stanley Cup. Twenty-one years later, the 46-year-old Nicklaus’s win at Augusta presaged a repeat of the same successes: the Shoe, the Celtics with the NBA and the Canadiens winning the Stanley Cup all in ’86. Australia in the Rugby World Cup; in 1999 Australia beat South Africa in RWC; in RWC 2003 England beat Australia and in 2007 South Africa beat England. Champions of 2011 by their defeat of holders South Africa in their quarter final encounter?. playing South Africa before their New Zealand rivals had the chance to do so in a semi-final. So if Deans can lead the Green and Gold to triumph on Sunday, will it be fate or misfortune? entire nation having a physical effect on the players? Seems strange, but the Mole has long come to accept that there’s nowt stranger than sport. despite the loss of Dan Carter and the prospect of a less than 100% fit McCaw, the AB’s are 4/6 and Australia 4/1 to take the trophy. So clearly, emotion and fate are on the side-line when it comes to the financial equation. the advantage of an Auckland Super 14 final victory against Deans’ Crusaders team in 2003 but Deans evened up the contest with his Tri-Nations success this year. Too close to call with any certainty, but just like the Spurs sequence, all sporting coincidences end at some point, and maybe the desire of the New Zealand nation will carry their wounded heroes into the final. This entry was posted in RWC 2011 and tagged Australia, Dingo Deans, Graham Henry, New Zealand, The Hydra, Whooda Thunk It? by dementedmole. Bookmark the permalink. Lies, damned lies and stats. Brilliant post mole……but we could equally say in New Zealand 87 Wales beat Ireland, but lost a semi final. France got to a final but lost to NZ, who had the best openside in the world. So let’s all back NZ! But wait, all the favourites have lost in the knockout stages this yr (bar NZ – arg). So it has to be the aussies at 4 to 1? It becomes an historical quagmire, so you are better having at least some logic dictate your reasoning, though after watching France Wales and aus s. Africa it is hard to make any sense or logic out of it in fairness! I reckon just read quade cooper’s star sign in the morning papers and tip accordingly.